Dot Plot – Will it drop from 2 to 1 rate hike for 2019? Economic Projections – Will growth or inflation forecasts be lowered? Fed Chair Powell’s Press Conference – Will Powell’s outlook be laced with optimism? The most telling part of the FOMC rate decision will be the dot plot forecast. Back in December, when it was last updated, the Fed’s projection dropped from 3 to 2 rate hikes in 2019. Now the question is whether that changes to only 1 hike this year. The Fed has made it clear that they are in no rush to raise interest rates and in response, Fed fund futures are pricing in a greater chance of a cut than a hike this year. So by reducing their rate forecast this month, Fed officials would be brining themselves closer to market expectations. Even though it may be expected, if the dot plot drops to 1 rate hike, USD/JPY should break 111. If the dot plot remains unchanged, we could see USD/JPY trade back to 112 and EUR/USD drop to 1.13. In December, the Fed lowered its GDP and inflation forecast and investors will be watching to see if growth expectations are slashed even further. Although the central bank is worried about global economy, the domestic economy is still holding up well with stocks recovering and oil prices up almost 40% from its December lows. 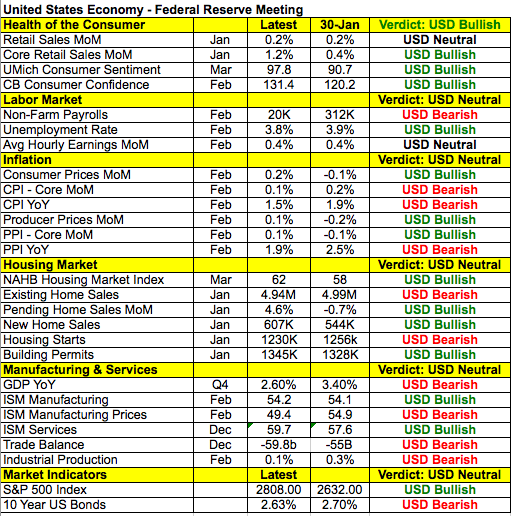 Taking a look at the table below, there have been more improvements than deterioration in the US economy since the last central bank meeting. Manufacturing and service sector activity is on the mend while inflation iicked up after falling in January. The unemployment rate continues to improve and average hourly earnings growth is strong. However inflation in general is trending lower on an annualized basis and after the meager 20K rise in jobs last month, the central bank will be eager to see how much job growth recovers in March. For all of these reasons, the Fed may leave their economic projections unchanged until the outlook for the economy becomes clearer. That leaves us with the guidance from Fed Chairman Jerome Powell. When he last spoke on March 8th, he said “Nothing in outlook demands for Fed policy response now. Patience is warranted because of muted inflation. Downside risks have increased like Brexit and trade.” Most of his peers share this cautious view but with a lengthy press conference to get through, his outlook could be laced with optimism. In December when they cut their dot plot and lowered their economic projections amidst sharply falling equity prices, Powell said financial market conditions have not fundamentally altered their outlook and this comment alone was enough to drive the dollar higher. We can’t rule out this possibility tomorrow even though all signs point to a less hawkish Fed. Euro is still flirting with 1.1350 while GBP awaits the EU meeting. Although an uptick in the expectations component of the German ZEW survey helped to lift the single currency, there’s significant resistance at 1.1350 and a meaningful break may not happen until the FOMC announcement. Sterling is supported by stronger labor market data (the unemployment rate declined and average hourly earnings growth was strong), but UK Prime Minister May has not asked for an extension of Article 50. She is expected to do so before the European council meeting begins but its not clear how long of a delay would be requested and then granted. May previously hoped for a short extension to June 30th but the EU prefers a long delay because they don’t feel confident that anything would be accomplished in such a brief period. A long extension would be more positive for GBP than a short one and we will know how UK Prime Minister plans to proceed in the next 24 hours. In the meantime, UK inflation data is scheduled for release tomorrow and the recovery in oil prices should boost inflationary pressures. Lastly the Canadian and New Zealand dollars traded higher today while the Australian dollar pared back. NZD shrugged off weaker consumer confidence in favor of higher dairy prices while CAD was supported by oil. AUD on the other hand was hurt by lower house prices, falling Australian bond yields and a central bank that sees “no strong case for policy adjustment” given considerable uncertainty around the consumption outlook and weaker housing investment according to the RBA minutes.